I’ve always had a soft spot for descriptive lyrics, especially the kind that yield esoteric insights or observations yet resonate in universal and often strikingly personal ways. Considering this, I really should’ve caught on to Dar Williams a long time ago. It’s not like I’d been unaware of the singer/songwriter’s music altogether. I’d heard bits and pieces over the years, but mostly on tracks written by other artists. Her cosmic, quirky cover of David Bowie’s “Starman,” for instance, initially piqued my interest, much like her duet with Ani DiFranco on Pink Floyd’s “Comfortably Numb” did a few years later. Yet it was her rendition of “You Won’t See Me,” from This Bird Has Flown: A 40th Anniversary Tribute To The Beatles’ Rubber Soul, which intrigued me the most, with her unassuming vocal and loyalty to the lyric’s point of view belying any trace of irony or artifice. And so it was a burgeoning curiosity that invariably led me to Williams’ most recent album, Promised Land. Invested with picturesque and pensive narratives on the human condition, it’s a beautifully stirring work. Moreover, Williams doesn’t forsake a good (memorable) melody to tell a story here, but rather she crafts a balance between her words and music. From the feisty opener, “It’s Alright,” through more tempered (though no less engaging) tracks like “The Easy Way” and “Troubled Times,” she reflects a storyteller’s perceptions, enriching tales of emotional hurdles and lessons with empathy in her voice. Williams is at her most affecting, though, when she leans toward introspection. As in “You Are Everyone,” which finds her remembering an old flame who still weighs heavy on her heart, conceding as if in a soliloquy, “You are everyone I ever trusted/ Who never made a fool out of me.” As well, on “The Business of Things,” she achingly resists the apathy (if not the cruelty) she sees others purveying—“It’s the way things are done,” she concludes in dismay—by the strength and will of her own compassion. In both cases, Williams taps into such unguarded, unnervingly honest thoughts and feelings—and marries them to equally poignant music—in such a way that makes the listener feel viscerally connected. 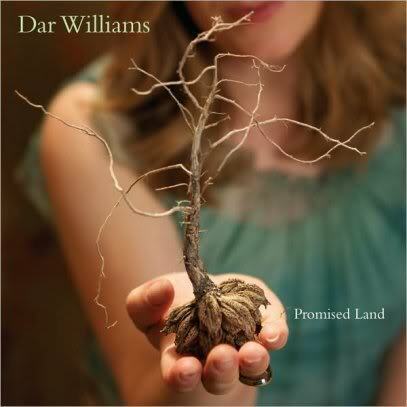 Perhaps such is the hallmark of all great songwriters, but Dar Williams has nonetheless made that kind of impression on me with Promised Land, making me now want to work my way backwards through her catalog to discover more of what I’ve been missing. Find out more about Dar and listen to clips from all her CDs on darwilliams.net.